OK, so I did another chromatography test on my Sangiovese/Cabernet blend at Michael Florentino Cellars and it still has not converted all of the malic acid to lactic acid! So time to crank up the heat in the “wine shed” out back. Hope that works! I am starting to worry that it has gone to long with out any additional SO2. Keeping my fingers crossed on that one! Mean while back at the ranch (or property) for the first time of the season was March the weekend of the 11th! Friday was sunny and mild and very therapeutic! We have finally cleared enough sage brush to plant our first test block of one hundred vines for this coming May. I have ordered Cabernet Franc, Malbec, Pinot Noir and Viognier from Inland Dessert. However, I am seriously thinking about switching out the Viognier for Pinot Blanc, which is more cold hardy and seldom seen in Washington state, but maybe should be seen more! Brad Sherman of MFC and me! Also, last Sunday (March 27th.) 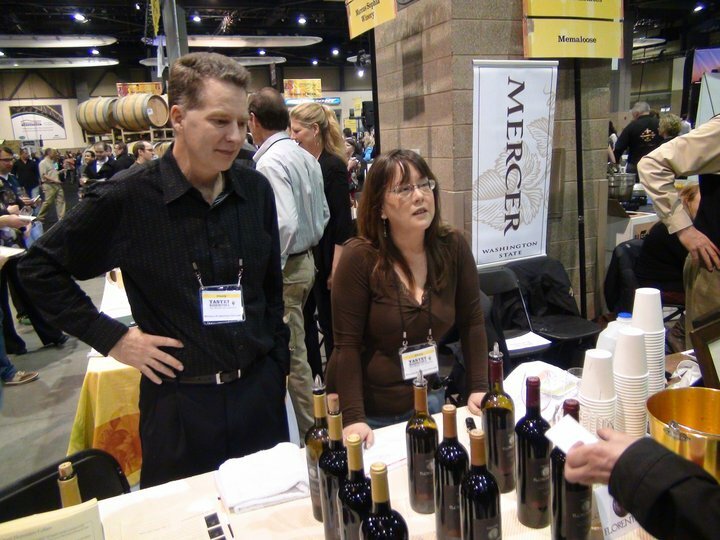 I actually got to try the “Grand Tasting” at Taste Washington for the first time, since I was pouring for MFC, instead of doing a seminar on Saturday. Not as crowded as years past from what I hear, but at a great time and saw lots of familiar faces. Next up: Rose of Monastrell Release party at MFC, April 23rd and 24th. in the Woodinville Warehouse District. Monastrell is known as Mourvedre in France and most of the U.S.
Posted on April 1, 2011, in My First Wine series, Uncategorized. Bookmark the permalink. 4 Comments. Wish I could have made it to the booth to say a proper hello last Sunday. Hope you were able to get out and get some tasting done! Yeah, I did get to try quite a bit! How bout you? Or were you stuck up front all day? I loved that it was less crowded this year although that means less in the coffers for WWC, but it was nice to not feel I had to leave when they opened the doors at 4:00. I didn’t make it to MFC table but Sonie of Hansen and Hansen brought some by the wine shop a couple of months ago. While we weren’t in a position to buy then, everyone really enjoyed their wines. The Port was a real hit! Yeah, it was nice that I never had to wait in line to try any wines! MFC is having a Rose release party April 23rd with some fun food pairings. Please come by if you can, there will be other wineries in the “hood” with events going on too!